do textu napište Vaši e-mailovou adresu a slovo "zasílat". 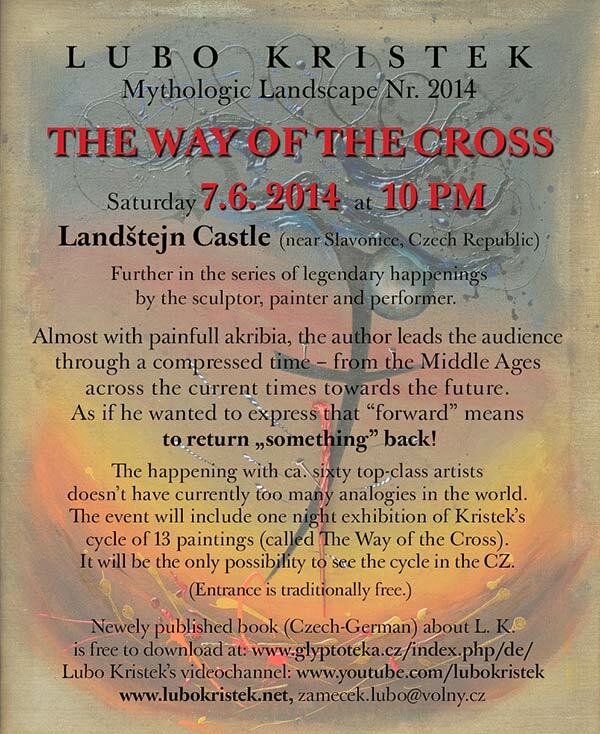 In his happening The Way of the Cross on 7th June 2014 at Landstejn castle, the sculptor, painter and performer Lubo Kristek lead the audience on a time-compressed journey from the Middle Ages across the current times towards the future. As if he wanted to express that “forward” means to return “something” back. After the collapse of humankind, the spectator ascended to the vision of timelessness to witness the unveiling of Kristek's cycle of thirteen paintings carrying the same title as the happening. The thirteenth painting, called Sublimation of Gold, which is Kristek's contribution to the theme of the way of the cross, was unveiled by a pregnant angel extricated from a heap of bodies and crosses by the Innocence from the Cosmic Unconsciousness. The angel reveals her secret – a golden cage with a pigeon, which symbolizes the soul of a tortured civilizational clown. At the same moment as the angel releases his soul into the light of eternity, the clown's life trickles away. 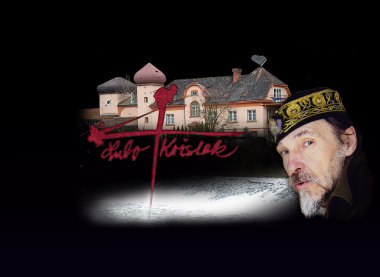 The entrance to Lubo Kristek's happenings is always free.